The Turkish Anatolia News Agency reported Tuesday that Hezbollah Secretary-General Hassan Nasrallah became ill a few days ago, was admitted to a private hospital in Beirut and later flown to Tehran, this after a number of Lebanese news outlets reported over the past 24 hours that Nasrallah was diagnosed with cancer and is being treated in Iran. The reports have not been confirmed. The Turkish news agency quoted "knowledgeable sources affiliated with Hezbollah" as saying that Nasrallah was flown to Iran after being released from a hospital in south Beirut. His flight left from the Rafik Hariri International Airport in Beirut, they said. The sources said the leader of the Lebanese terror group was in stable condition and that he remains hospitalized in Iran. A Hezbollah source denied the reports in an interview with the Al Mayadeen satellite network on Tuesday. .
Lebanon’s Sawt Beirut International radio station, which is affiliated with political groups opposed to Hezbollah, quoted sources who are "close" to Hezbollah as saying Monday that Nasrallah was recently diagnosed with cancer and that his condition was deteriorating. According to the report, Nasrallah, 52, traveled to Tehran on a private plane sent by the Iranian presidency. A Jordanian news website reported Monday that Nasrallah may have been injured during the shelling of Hezbollah positions this week by the Free Syrian Army. 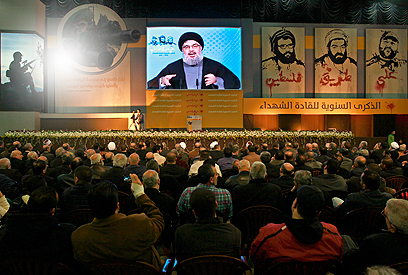 Nasrallah's last appeared 10 days ago when he delivered a televised speech to mark the annual "Shahid Day." See all talkbacks "Reports: Nasrallah flown to Iran for cancer treatment"